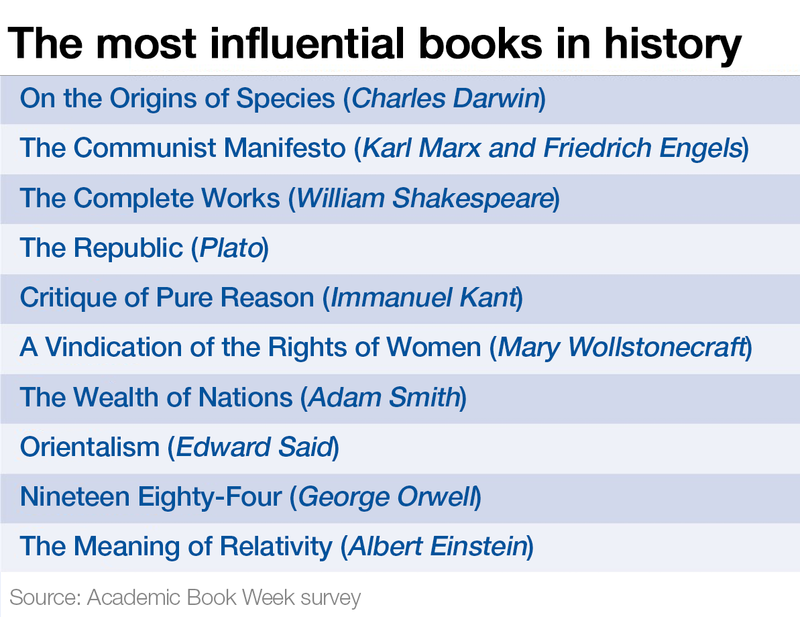 What’s the most influential book you’ve ever read? For most of us, that’s a tough call to make. But that was the question put to the public ahead of Academic Book Week. An expert panel of academic book-sellers, librarians and publishers nominated 200 titles, and members of the public were asked to vote online for their top 20. Many of the books that make up the final 20 are hundreds – in one case thousands – of years old, proving that the best works really do stand the test of time. How many of these classics have you read? Why you should read it: It’s simple: “No work has so fundamentally changed the way we think about our very being and the world around us,” says Alan Staton, head of marketing at the Booksellers Association. Why you should read it: Elizabethan poet Ben Jonson said that Shakespeare was “not of an age but for all time”. He wasn’t wrong. Centuries later, Shakespeare’s plays are still by far the most studied and performed in the English-speaking world and beyond. Why you should read it: Not only is it an important piece of work from one of the most influential philosophers, it’s also very readable. “Plato did not write philosophy like a dry textbook – he wrote it like a living conversation,” says Robin Waterfield, a classics scholar. Why you should read it: At a time when revolutionaries were demanding equal rights for all men, Wollstonecraft demanded those rights be extended to women: “The book laid out the tenets of what today we call ‘equality’ or ‘liberal’ feminist theory,” says Anne Mellor, a professor of women’s studies. Why you should read it: Smith’s book has been described as “the foundation of economics, the origin of econometrics and the intellectual cradle of capitalism”, all of which are as relevant today as they were when he wrote it. Why you should read it: Said’s book sought to reveal the West’s patronizing and largely inaccurate understanding of Asia, North Africa and the Middle East, and how these views help to “mobilize fear, hatred, disgust and resurgent self-pride and arrogance – much of it having to do with Islam and the Arabs on one side and ‘we’ Westerners on the other”. Unless you’ve been living under a rock since September 2001, you’ll understand why this book is as pertinent as ever. Why you should read it: “It’s much more than a book – it’s a novel of huge social and political significance that’s never going to date,” says Abe Books, especially in an age of digital surveillance. Is Big Brother watching you? Why you should read it: Einstein said his goal with the book was to give an insight into the theory of relativity to interested non-experts. This work does exactly that: “Nobody is better at explaining relativity than Einstein himself; his account provides a combination of depth and clarity that only he could confidently produce,” writes Tom Siegfried of Science News. Why you should read it: Times have changed for women since this book was first published. But Beauvoir’s central argument that “one is not born, but rather becomes, a woman” and her detailed examination of women throughout history still makes for a compelling read. Why you should read it: Paine was “an original thinker, far ahead of his time,” says John Belchem of the University of Liverpool. The Rights of Man, written while Paine was taking part in the French Revolution, addresses issues – poverty, inequality, welfare – that are still hotly debated today. Why you should read it: It tackles one of the biggest and most intriguing questions: where did we come from and where are we going? “I wanted to explain how far we had come in our understanding of the universe: how we might be near finding a complete theory that would describe the universe and everything in it,” writes Hawking. Why you should read it: When Carson, a former marine biologist, took on the chemical industry and revealed the damage pesticides were doing to the planet, she probably didn’t know how much of an impact her book would have. Described as “one of the most effective books ever written”, it paved the way for the modern environmental movement. Why you should read it: Even to this day, both Greer and her book divide feminists. And perhaps that’s why it made it on to this list: it still gets people thinking about and debating important issues. “Her insights, while not always strictly accurate, offer revelatory analysis, and in a language so searing it galvanizes us to reflect more deeply on the status of women and the nature of gender relations,” writes Zohra Moosa of Mama Cash. Why you should read it: The Prince provided aspiring rulers with a guide on getting power and holding on to it. “It may give readers an insight into the mindsets of leaders caught taking an ends-justify-the-means approach,” whether that be politicians or your boss. Why you should read it: Berger’s book, based on a BBC television series, explores the way women and men are represented in culture, and how these representations influence the way they act. Thirty years after its release, the Independent described it as “a rare example of that much-claimed title, the trailblazer”. Why you should read it: With all the talk of income inequality – how it’s increasing, the many problems it spawns – Hoggart’s book about the working class is well worth a revisit: “Despite the social and economic transformations, thousands still recognize the life depicted – we should be closer to a classless society, but are not,” wrote Anita Sethi for the Independent. Why you should read it: In this bestseller, Morris, a zoologist and ethologist, explores the human species by comparing them with other animals. He’s published follow-up books, but it’s this first one, and its “irresistible blend of hard science and populism” that still gets people talking.